A classic wall clock or 'timepiece' as it should be known. This example is slightly smaller than the traditional 12" dial and makes it rather more attractive. The case is a pleasing figured mahogany with a convex lower section and door to the trunk held with a lock and key. Side door held with a traditional latch and cast bezel held with the original lock and key. 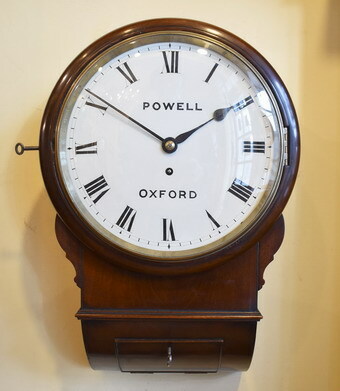 The 10" dial bears the name Powell of Oxford who may have been the maker or retailer of the clock. We have not yet been able to find any information of this maker - retailer yet. The high quality fusee movement is now fully overhauled and sold with a 24 month guarantee. Please try and visit us to view this clock. If you have any question or require further information about this item please call us on 01702 472574 or email us.